Fort Lauderdale, FL – Gas prices increased for the sixth consecutive week last week, going up six cents per gallon, on average, to settle at $2.07, according to the U.S. Energy Information Administration. The national average for regular unleaded fuel is now 35 cents higher than early February lows. Nearly a third of that increase has happened during the past two weeks, according to EIA data. Diesel prices went up in some regions, but remained fairly stable at the national level, remaining at $2.12 per gallon. In fact, prices across the midwest went down about a penny per gallon. Fort Lauderdale, FL – Gas prices increased for the fifth consecutive week last week, topping two dollars for the first time since January 11, when the national average was exactly that figure. The weekly gas price survey by the U.S. Energy Information Administration shows the average U.S. price for a gallon of regular unleaded settled at $2.01, up five cents over last week, and up nearly 30 cents since prices hit their lows in February, making for an overall 15% increase in prices in just over a month. Diesel prices also gained on the week, according to the E.I.A. report. Prices for diesel increased anywhere from three to six cents per gallon as the national average went up two cents to $2.12 per gallon. Fort Lauderdale, FL – Gas prices surged on the week, according to the U.S. Energy Information Administration, as the price of crude oil rebounded and refiners continued switching to new summer gasoline blends ahead of the busy driving season. This week’s E.I.A. survey shows the price of a gallon of regular unleaded jumped 12-cents per gallon to $1.96. The increase was more than the previous three weeks’ price advances, combined. Prices surged by double digits in all regions except the Rocky Mountain states, and the broad west coast region, sans California, slipped above the two-dollar price point for the first time in several weeks. Diesel prices also surged, according to the E.I.A. report. Prices for diesel increased anywhere from six to nine cents per gallon, and the national average price jumped from $2.02 last week to $2.10 this week. Fort Lauderdale, FL – The upward swing in gas prices extended into a second week this week, according to the latest report from the U.S. Energy Information Administration. The E.I.A. 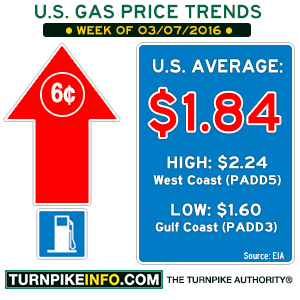 weekly data show the average price of a gallon of gas is now $1.84, with prices rising in all regions. The price of diesel also went up three cents, according to the report. The average price of diesel has gone back above the two-dollar threshold to settle at $2.02. Regional cost averages for both gasoline and diesel are listed below, ranked from highest to lowest price.